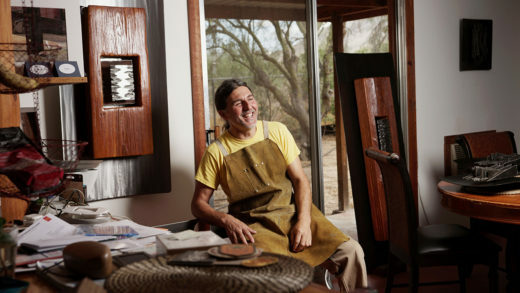 Amidst the sprawling Sonoran Desert, the saguaro cactus makes its exclusive home. 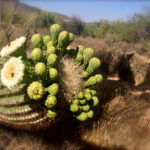 It is here, and only here, that the largest and perhaps most treasured cactus in the United States finds living conditions required for its survival: a hot, dry climate located between sea level and 4,000 feet in elevation. The summer monsoon season is also vitally important, as it supplies the rainfall that hydrates the saguaro all year long. The saguaro’s scientific name is Carnegiea gigantea. It is not a coincidence that the name Carnegiea sounds similar to the last name of the famous philanthropist Andrew Carnegie. It was given in honor of Carnegie for his generous support in the research of desert plants. 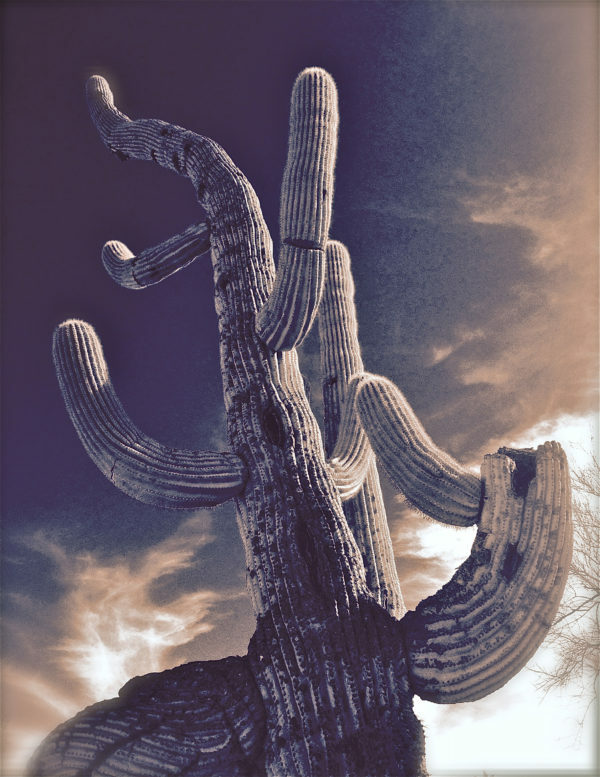 The quintessential saguaro is often depicted as having two arms growing upward out of its trunk. While an accurate portrayal for some, this form is not considered the standard. 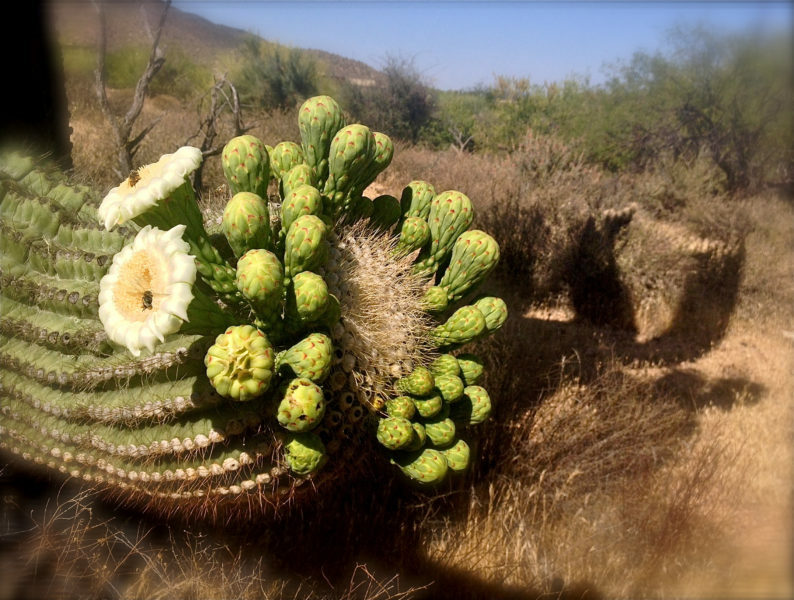 In fact, it is possible for a saguaro to produce as many as 50 arms. Those arms do not always grow upward; if exposed to extreme frost, freezing temperatures or too much irrigation, the arms can droop. 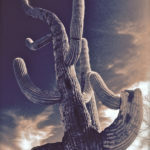 While most saguaros produce a rounded head, some deviate from this norm, instead growing a fan-like form on the top of the trunk. Because of this rare formation, it is dubbed the cristate, or crested saguaro. Scientists have yet to uncover the exact cause of this anomaly. 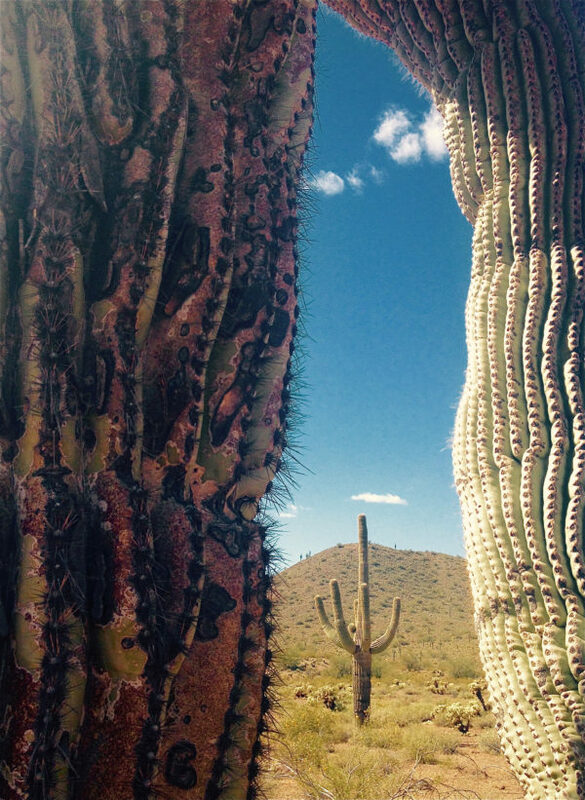 Although saguaros engulf the desert landscape, the road to becoming a saguaro is not an easy journey. 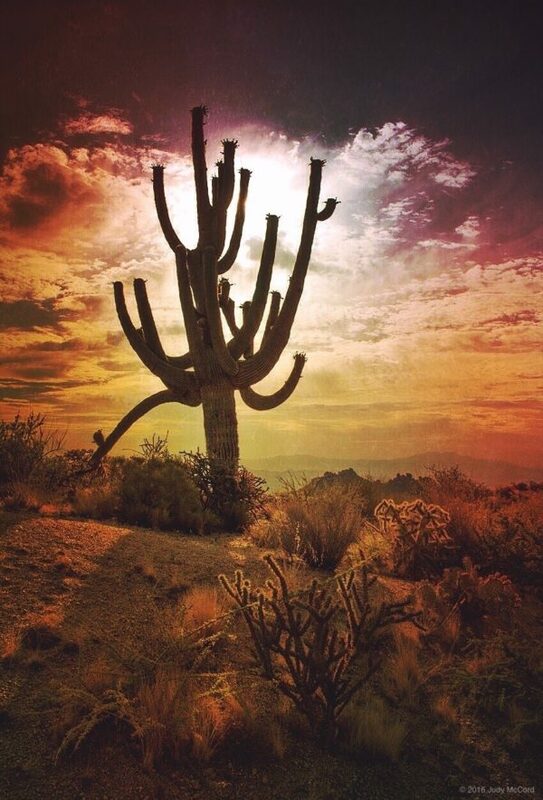 It is believed that out of a saguaro’s 40 million seeds, only one may survive to adulthood. This low survival rate is a result of many circumstances, including droughts, excessive freezing and being a food source for animals. 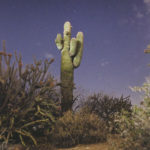 However, if a saguaro does survive, it is thought that it can live between 150 and 200 years. When a young saguaro is fortunate enough to take root under a tree, its chances of survival increase. This nurse tree, most often a palo verde, ironwood or mesquite, provides much needed protection from the harsh desert elements. Unfortunately for the nurse tree, as the saguaro grows, it absorbs all the nutrients and water from the surrounding soil, which can ultimately kill its protector. 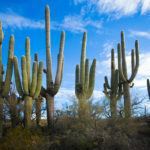 From seed to adulthood, the growth of a saguaro is extremely slow: a 10-year-old Saguaro reaches a height of approximately two inches. 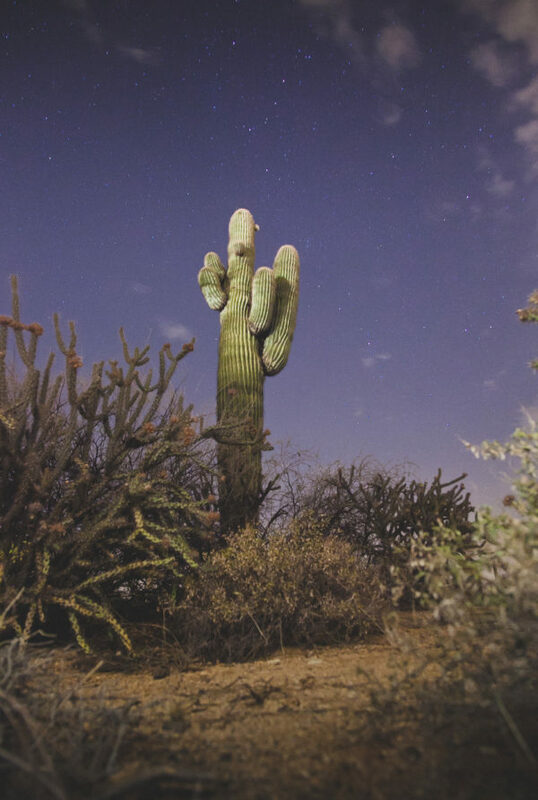 Although the saguaro is on the short side during its youth, by adulthood — roughly 125 years of age — a saguaro’s height can be measured anywhere from 40 to 60 feet tall. 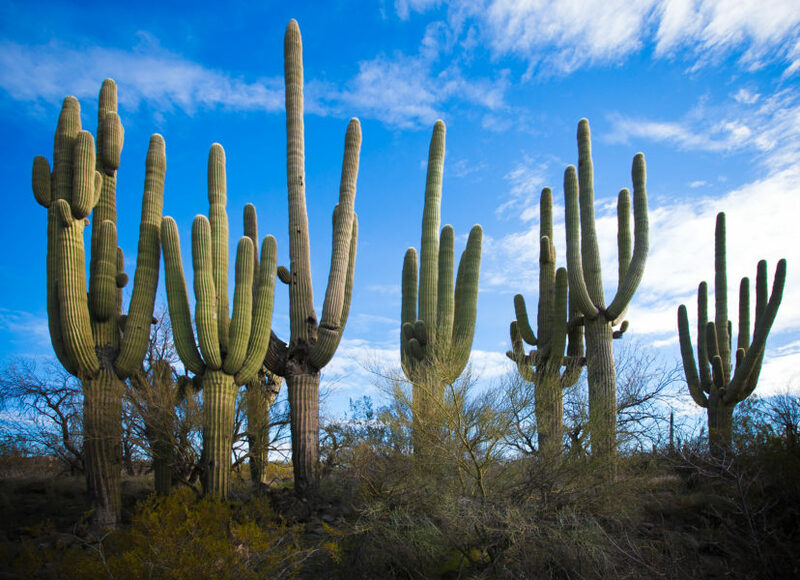 During the rainy season, a saguaro will expand its body to absorb as much water as possible. Because of this, it is possible for a saguaro to weigh an unbelievable 3,200 to 4,800 pounds. To put that into perspective, one cactus can weigh about the same size as a small adult elephant. For many birds, the saguaro has become the perfect place to raise a family. Burrows in the trunk will house nests made for baby gilded flickers, Gila woodpeckers, owls, sparrows and others. Since larger birds might be too large for a burrow, the arms of a saguaro are the next best thing for their nests. The saguaro’s creamy white flowers (Arizona’s state flower) are situated at the ends of its trunk and arms. Every year, from April through June, the flowers bloom and reveal an orange center ready for pollination. A few flowers open each night, only to close again by the next afternoon. Bats — especially because they are nocturnal — bees, butterflies and white-winged doves are some common pollinators of the saguaro. Once fertilization of the flower occurs, a green fruit will begin to grow. Inside this fruit is a sweet, red center that is a food source for many animals, such as woodpeckers, finches, bats, javelinas and coyotes. Some of the fruit’s seeds will pass unharmed through the animal and, once secreted, will begin the process of growing into another saguaro. 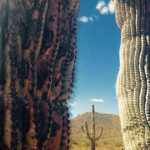 Native Americans have a special relationship with the saguaro. They have used the cacti’s woody ribs for shade ramadas, fences, furniture and more. The saguaro boot, a hardened shell of a dead saguaro’s burrow, has been used to store and carry water. The Tohono O’odham tribe in Southern Arizona makes wine, jams and jellies from the saguaro’s fruit for the Nawait l’i, a rain ceremony for the coming monsoon season. 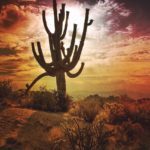 Though they have become an icon of the American West, you will only find the saguaro in Southern Arizona and Western Sonora, Mexico — although a few strays may also be found in Southeast California. 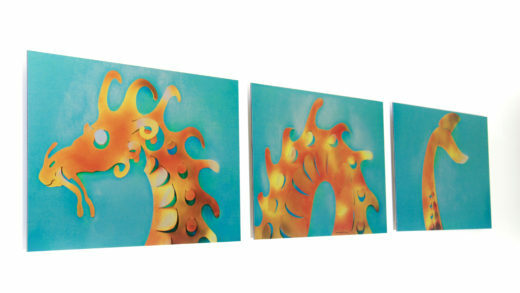 They are a shining emblem of the Southwest, right in our own backyard.